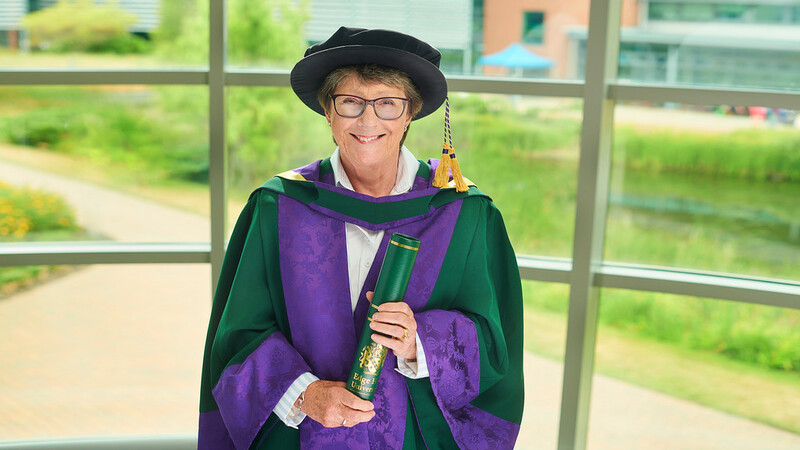 A medical expert who has helped to improve the education and training of a generation of health professionals has been awarded an Honorary Doctorate in Science by Edge Hill University. Professor Jacky Hayden CBE has worked across the North West as Dean of Postgraduate Medical Studies at Health Education England. She started her career as a GP in Bury, where she continued to practise medicine until 2009 alongside regional and national roles in medical education and the Royal College of General Practitioners. In 2012 she completed four years as the Chair of the Committee of English Deans, she was an inaugural member of Medical Education England and an active participant in the Medical Programme Board, where she led work on metrics for medical education. Jacky took an active role in the Royal College of General Practitioners, serving for 27 years on the council. She also received a CBE in 2013, the same year she was named as one of the Health Service Journal’s Top 50 Inspirational Women. The Royal College of General Practitioners awarded her the prestigious William Pickles Medal and the Foundation College Award. She retired from her work as Postgraduate Dean in September 2016 but continued to work in medical education in roles in the GMC, Medical Practitioner Tribunal Service Committee, Faculty of Medical Leadership and Management and she joined the Board of Plymouth Hospitals NHS Trust as a non-executive board member. She was also a board member of the Edge Hill Postgraduate Medical Institute and her guidance and experience during that time has helped contribute to the academic foundations of the University’s own Medical School. In the ceremony, Jacky had some words of advice for Edge Hill’s new graduates in Health and Social care. She said: “Throughout my career I have been fortunate to work with a range of wonderful leaders and I would like to pass on to you some of their messages. “The first is about working with others, leaving a meeting where both feel good about the interaction is ideal. Whether this is a patient, a client or a colleague, try to understand the other person’s position by listening more than talking and try to meet them in their place of work. This allows you to appreciate what is important to them and provides an added benefit of meeting others along the way and catching them doing great work. “The second is to take care of your signature. Once your name has been added to a document it becomes your responsibility. In our modern world the same applies to a login. Sharing logins can mean your name is associated with something you wouldn’t want it to be and in the worst case can make you culpable. “The third is to recognise that bad things do happen and it’s how you respond that counts. Learning the art of an effective apology is a must for all of us, as is the ability to bounce back from adversity and learn from it.